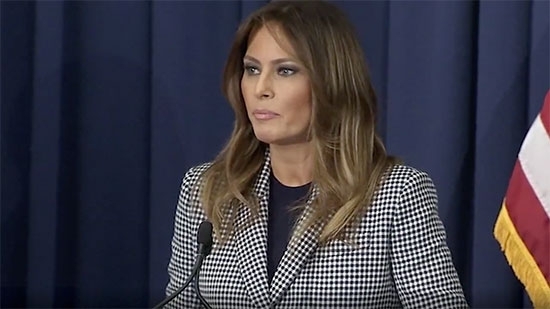 First Lady Melania Trump was in Philadelphia today to speak at a conference at Thomas Jefferson University Hospital on newborns exposed to opioids in the womb. She was late making her appearance because of a plane scare traveling to Philly. Trump departed Joint Base Andrews Air base in Prince George's County, Maryland. Shortly after takeoff there was a mechanical issue and smoke in the cabin. Press members in the plane were given wet towels to cover their faces. The plane turned around and made an emergency landing back at the base. She then flew on a different plane to Philadelphia. The neonatal abstinence syndrome conference is being hosted by the Department of Heath and Human Services. Some 8.5% of pregnancies are affected. "There are few things harder to bear than seeing a newborn suffer and I'm anxious to do all that I can to shine a light on this epidemic," Trump said. She toured the intensive care unit where newborns suffering from withdrawal were being treated. Trump is also meeting with mothers in treatment and families whose children are affected. Officials in Upper Bucks County are warning residents that there may be live explosives left unexploded around the area following a series of mysterious explosions last spring. David Surman Jr. and his girlfriend Tina May Smith of Milford Township have been arrested and charged for the 30 or so explosions heard between April and June. The warning comes as a result of a continuing investigation. "As always, our number one priority is to make sure everyone in Bucks County is safe, and we are sharing this information with that priority in mind. This is more an FYI than an SOS," said Bucks County District Attorney Matthew Weintraub. "Nonetheless, we will continue to do our best to protect you by working hard to find any unexploded devices that may remain. If you find something suspicious, please do not investigate it on your own. Call 911." Two people were killed and another was injured in a house fire in Burlington County on Tuesday night, 10/16. It happened around 8:30 p.m. in the 500 block of Willow Boulevard in Browns Mills. An elderly couple and their adult son were home at the time. 92-year-old Lore Smith and her husband died in the blaze. Their son, 59-year-old Kurt Smith was injured. Several police officers were treated with smoke inhalation. The State Fire Marshal’s Office, Burlington County and Pemberton Township Police are investigating the cause of the fire.